Kids say the darndest things, don't they?! 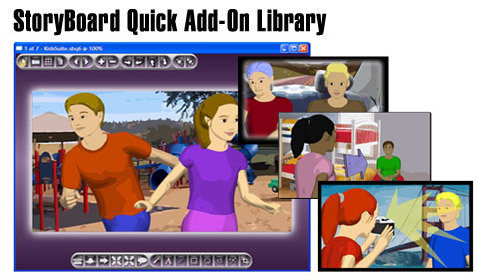 Now you can add a pair of great-looking, active youngsters to your cast of storyboard characters with the StoryBoard Quick Kids Suite. 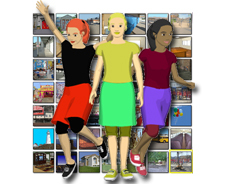 Our latest StoryBoard Add-On content pack offers new colorizable characters (Johnny and Jody) as well as a wealth of new Kids Locations and Props. Whether you are working on your next feature film, a family drama, student film or Disney movie, these great-looking additions to your StoryBoard Quick 6 application will give your storyboards the youthful look you want. Get The Kids Suite Today! Jody (Girl 1) can play ages ranging from early tweens to starring in her own show on the CW! Her stylish dress and sassy attitude will make any storyboard look like a winner. Johnny (Boy 1) is outgoing and adventurous. The younger of the two, Johnny is a great fit in any family comedy or Movie of the Week. Both of the new Kids are colorizable and can be added to your Character palette so you can have as many variations as you need! With NEW Locations and Props too, the new Kids Suite is the perfect expansion for your StoryBoard Quick or StoryBoard Artist app!